I loved the creative way that language was used to emphasize Todd’s lack of education without distracting from the experience of reading, a few words and expressions were deliberately incorrect throughout the book. And I really liked the chaotic ‘noise’ being represented on the page as blocks of crazy fonts – it really helped me visualise how overwhelming the noise would be. This book is filled with beautiful passages, but one of my favourites was definitely: “It’s like the song of a family where everything’s always all right, it’s a song of belonging that makes you belong just by hearing it, it’s a song that’ll always take care of you and never leave you.” I just adored this moment, the thought of a song of belonging that the characters so desperately needed made me tear up. Though the moment was filled with song, it felt like a silent pause in the narrative, a moment when at least one good experience is allowed to happen in a story about everything going wrong. The ‘knife’ in the title has a looming presence as a protector and an item of fear for Todd throughout the story. Could he really bring himself to kill? And if he did, could he possibly live with himself afterwards? These are big questions for a teenager to be grappling with, but I felt like Ness never held back from making the feelings and consequences of death at your own hands really impactful. 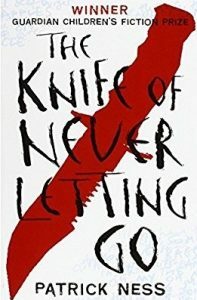 The Knife of Never Letting Go is not an uplifting, cheerful novel. It deals with some dark themes and violent situations, and the characters all struggle and suffer, but within that there is a strong thread of hope. The story ends on a cliffhanger, and I can’t wait to dive into the next book in the trilogy which is surely going to be just as brutal.